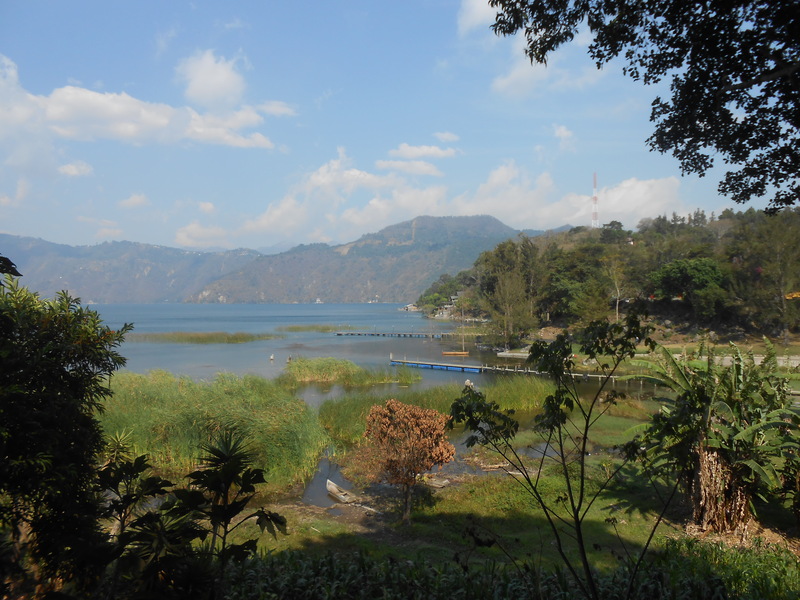 After deciding to cut our stay at IMAP short, or, rather, in half, Dave and I left San Lucas this week and headed off to the touristy side of Lake Atitlan in search of food we didn’t have to cook ourselves. One can only eat so many hard-boiled eggs. 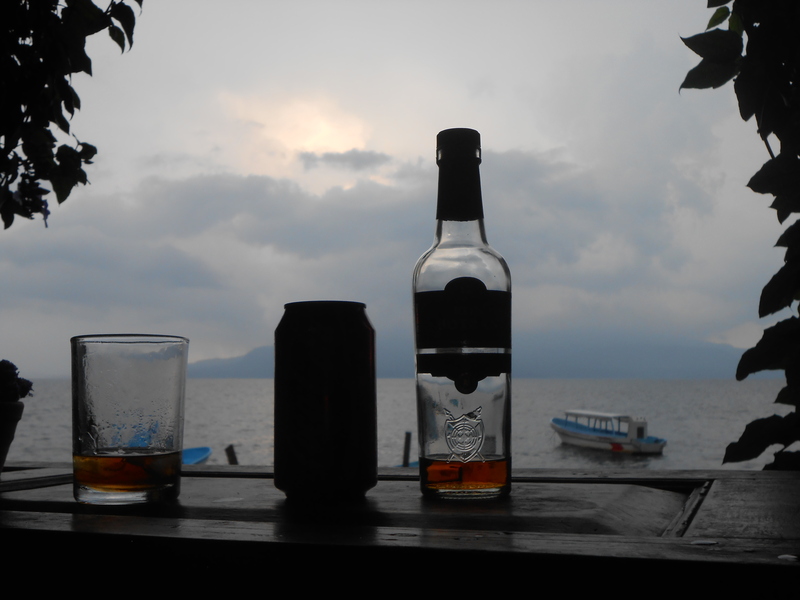 Remembering the cheap happy hour at La Iguana Perdida, we set our sights on Santa Cruz and those rum and cokes for 10 Quetzal — about $1.30 USD. 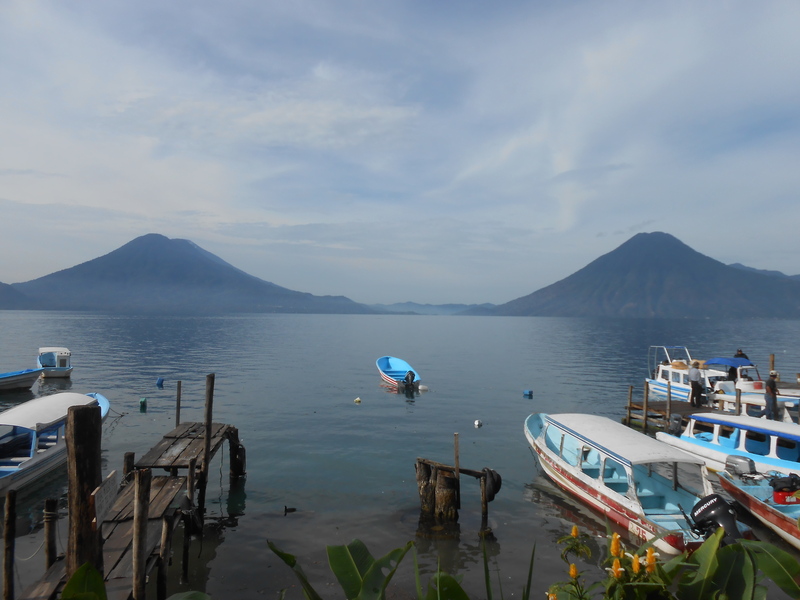 Like the chicken bus that we took from Guatemala City, the kitschy mode of transportation on the lake – really the only way to get around between towns along the water – is by small motor boats. Aside from the occasional lake spray that escapes the confines of the boats’ flappy, plastic windows, the experience is pretty much like any other 9-to-5, public transit commute. Often times you’re sitting next to locals who caught the rush-hour boat after work, and the rumbling motor lulls them to sleep after a tough day at the office. 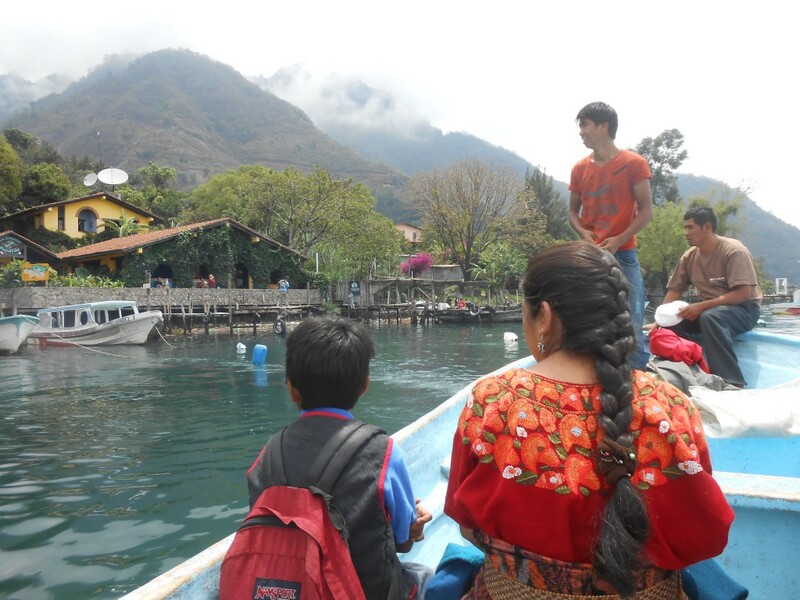 Still, you don’t have many options when it comes to transportation around Lake Atitlan, and the rides are pretty fun. Toward the end we learned to hold out for a better price and they usually took pity on us. Here’s the thing with permaculture: the goal is to emulate nature to foster a more symbiotic relationship between plants and plants, plants and animals and plants and humans. You’re aiming to create a forest, in a sense, that contains all your food. After a few decades work for the average gardener – or in this case volunteers – is eventually phased out. If done right, you don’t even have to water the plants. 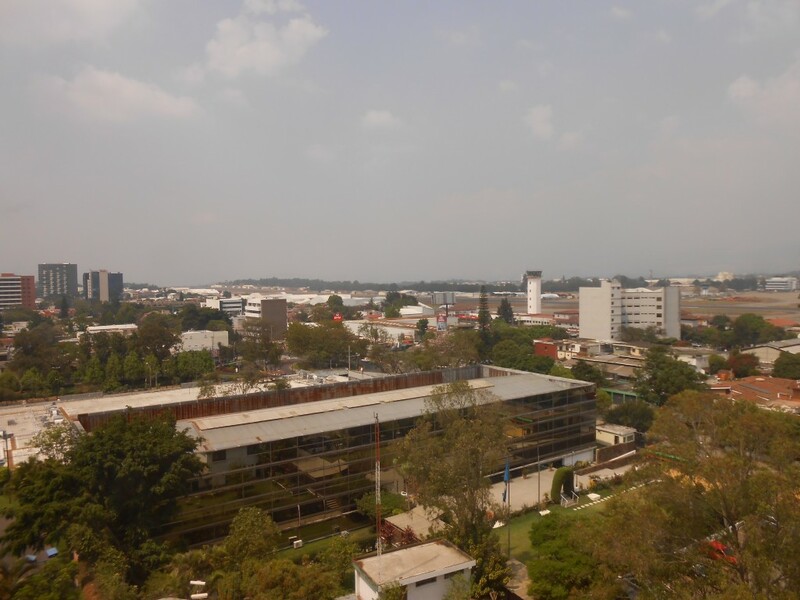 IMAP (Instituto Mesoamericano de Permacultura), where we are now, is a prime example of efficient, working permaculture, which is great to see firsthand, but can get kind of boring when your workweek is only about five hours long. 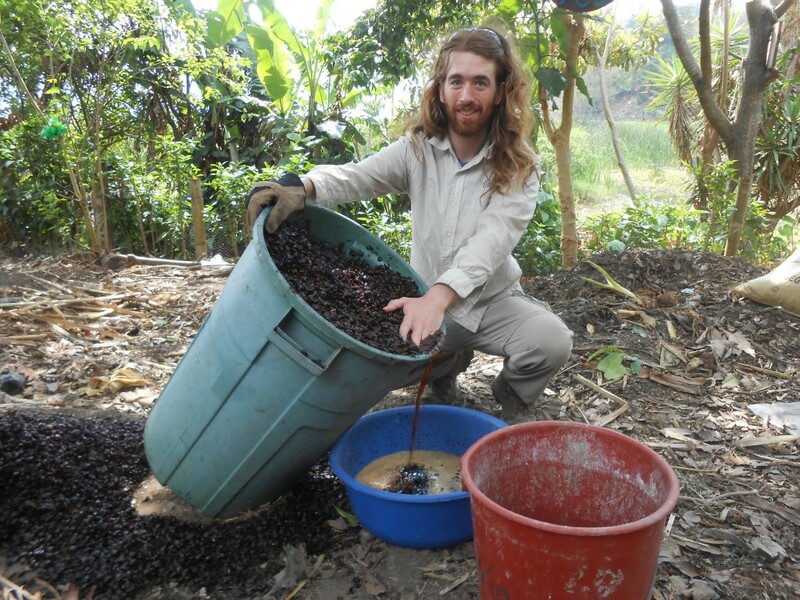 Here’s a photo of one task we undertook — making a compost tea from coffee shells. But it’s hard to complain when you wake up to this every morning. 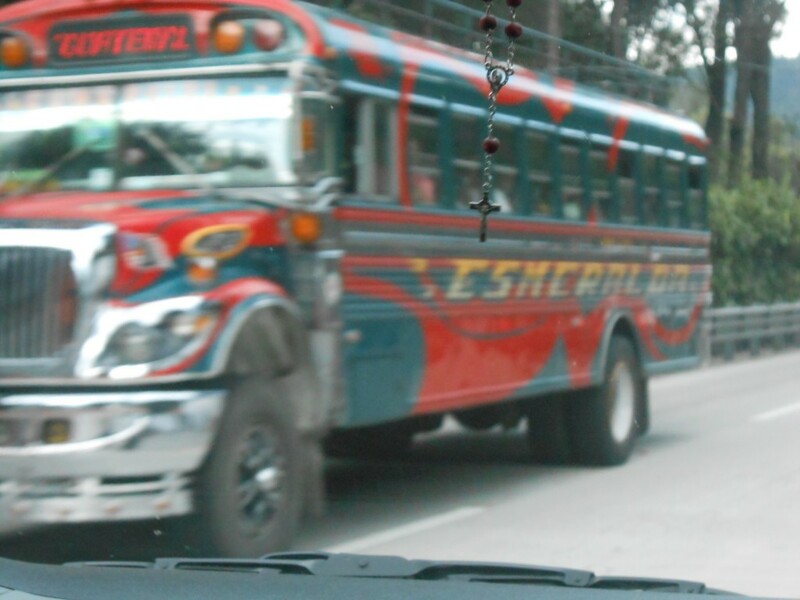 I suppose they call it that because you can carry your chickens on board — though this wouldn’t really distinguish these multi-colored Blue Bird school buses from any other buses that traverse Latin America. Instead, I think the way passengers are crammed onto the vehicle — sitting three to a seat and squeezing themselves into any available space left in the aisle — is more likely to have inspired the nickname. Riding a chicken bus must be what it feels like for laying hens in a factory hen house. This will give you a sense. After four months of traveling through south and central america I suppose it was naive of me to think there would be some sort of maximum capacity threshold on public transit. 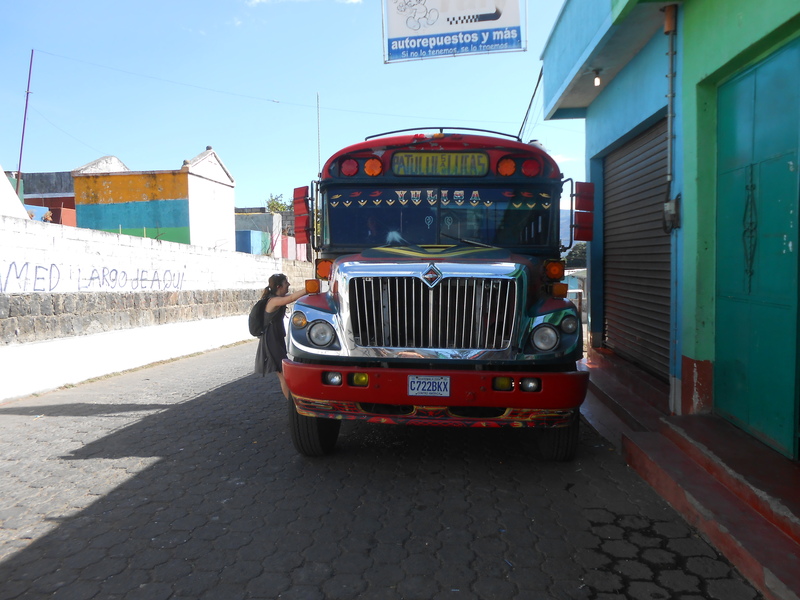 After we had filled three people to each seat, I thought the driver or pasaje man might say “no mas” and instead speed by hopeful individuals holding out for a ride. But this was not the case. Three to a seat? No problema. Just stand in the aisle. Can’t push your way through? Try flinging open the emergency exit door in the back and hopping on. This move somewhat complicates the pasaje man’s job, but each new passenger means more money, so he makes sure to catch all the riders. At one point this meant having to walk over the tops of seats in order to get back to the front, as the aisles were too congested for him to pass. 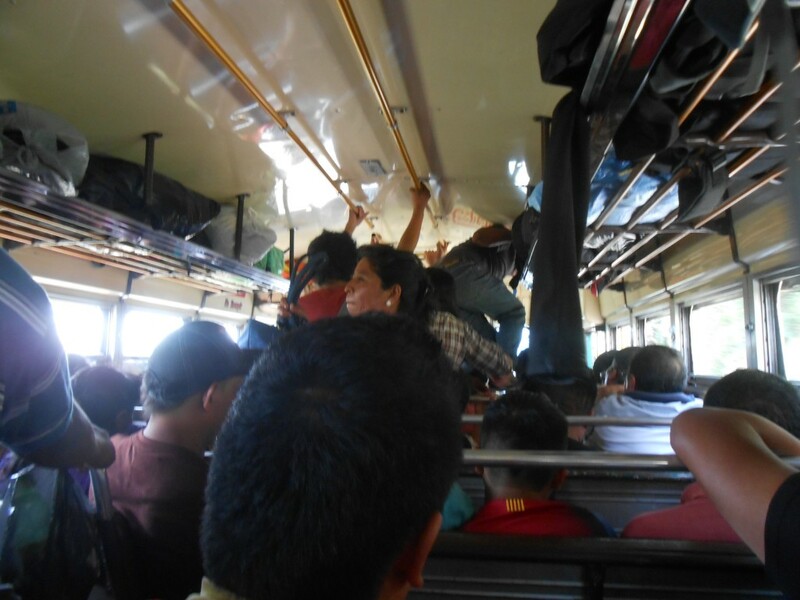 On our ride from Guatemala City to San Lucas, Dave and I put the maximum capacity around 75 people. Next time I’m presented with the option, I think I’ll go free range. 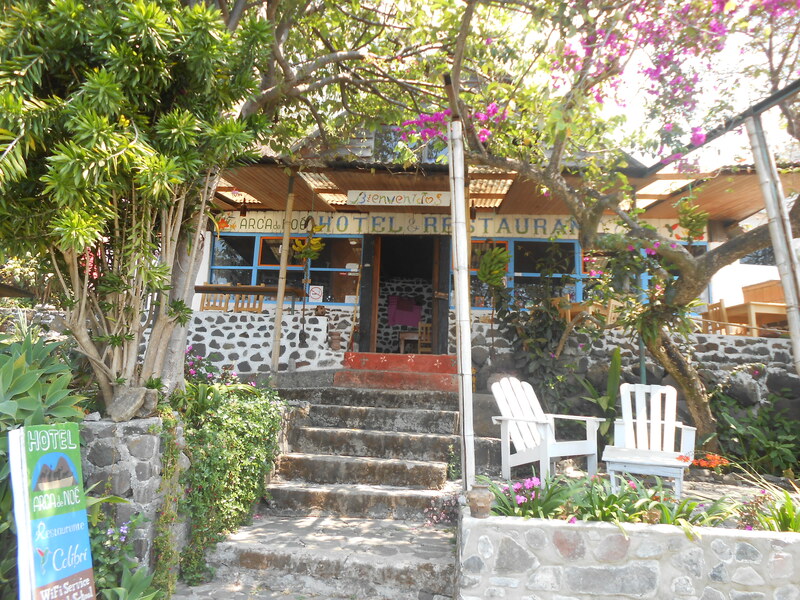 I guess Lake Atitlán is known for more than just permaculture. 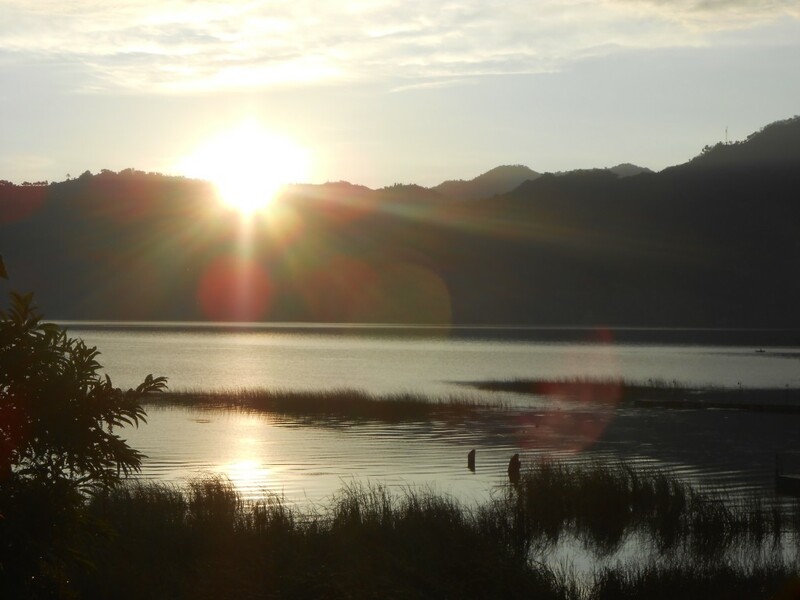 Turns out it’s a huge destination for tourists, as it has several pueblos dotted around the lake that range from party cities to tranquil escapes. And – who knew – it’s especially popular with DC-ers. Yesterday Dave and I took the boat shuttle across the lake to meet up with two of my friends from DC. Incidentally, their meet up was unplanned as well, but ran into each other in Antigua and even booked the same hostel on Lake Atitlán. And just like DC we all met up for happy hour. The other side of the lake is worlds different than San Lucas Toliman and Patchitulul. 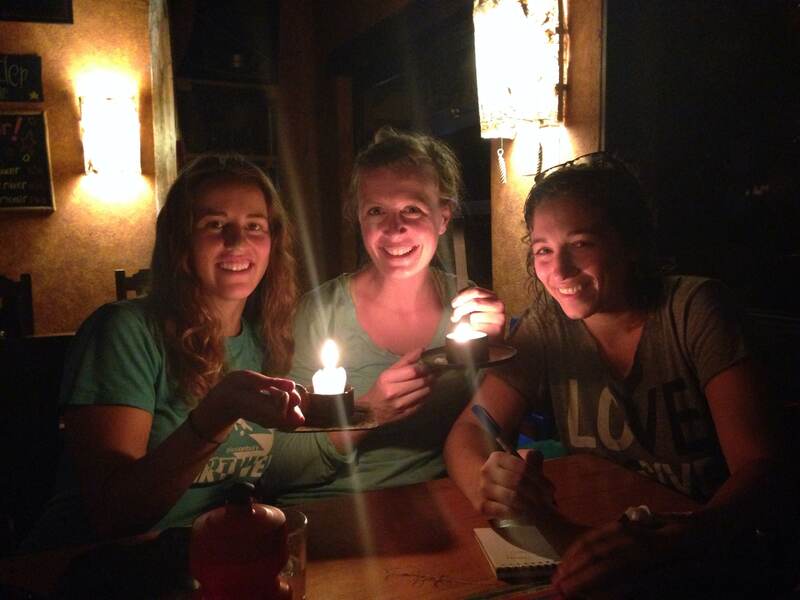 For the night we traded our five-home community and homemade tortillas for eggplant parmesan and couches. That might not sound like much, but after cold outdoor showers, a communal kitchen and bunkbeds, the hostel in Santa Cruz was pretty luxurious. Made it to Guatemala City! After just over an hour-long flight, we arrived in the capital, which turned out to be even smoggier than Mexico City. Like most of the capital cities in Latin America, Guatemala City is nestled in a valley and surrounded by mountains, I think. It’s a bit too hazy to make them out. Though in our hotel’s brochure the penthouse view is extraordinary. Aside from our photoshopped vista provided in our hotel’s brochure, our short venture through the touristy/financial district also colored my first impression of Guatemala City. Something was slightly amiss in what resembled a swanky Mexico City neighborhood and perhaps it had to do with the dozen or so “security” guards standing outside the restaurants, parking garages and strip malls holding AK-47s. Their stagnant expressions weren’t exactly putting me at ease. Later on, a conversation with a cab driver – coupled with Wikipedia research – only made things worse. Turns out, according to our cabbie, pretty much everyone in Guatemala City is armed, certainly the ones driving nice cars. This is for security, he told us. Though to protect yourself from what or whom, I’m not sure. Wikipedia mentioned that Guatemala’s civil war between the government and rebels — that began in 1960 — only ended in 1996, and new information about war atrocities along with genocide accusations are still coming to light. Maybe I learned too much last night, or maybe it’s just first-day jitters, but I was pretty happy to board the ancient Blue Bird school bus and put 100 km between me and the city.